What Is a Solar Water Heater? What Is a Solar Water Heater? Is a Solar Water Heater for You? The solar water heater is a cost-effective way to supply your home’s hot water. It is suitable in any climate since its fuel source is free and limitless: the sun. Every system consists of a solar collector and a storage tank with self-explanatory jobs. Solar water heater systems usually come in two types: active and passive. The former uses circulating pumps and controls to distribute warm water through the house, but the latter doesn’t have these features. Instead, passive solar water heaters rely on natural convection to circulate their output. Which Is the Most Promising? The most viable equipment to buy is one that works well even if it’s freezing. This is why you can expect an active solar water heater with an indirect circulation system to function well all year long. Its pumps are not filled with water but with a non-freezing fluid that transfers heat to the water. But if you prefer a passive solar water heater, the thermosiphon system is a good candidate. It can work efficiently even with freezing temperatures. If your roof’s design can accommodate its size and heft, then it can be the answer to your water-heating needs. Solar water heaters are weather-resistant by design. However, the biggest threats to their performance are dirt and vegetation growth. While freeze and corrosion can be a concern, well-designed units are mostly impervious to them. Hydronic-based systems are also prone to scaling, which forms due to the rich mineral content of domestic water. Hard water leaves calcium deposits that can cause the premature failure of affected components. The frequency of inspections and likelihood of tune-ups depend largely on the type of system you have. Manufacturers usually recommend the appropriate maintenance schedule. Upgrading to a solar water heater system is a step toward independence from fossil fuel. It’s imperative, however, to evaluate the amount of solar energy you can actually harness for water heating to gauge its feasibility. Also, you ought to work with a qualified company to ensure not only flawless work but building-code compliance as well. 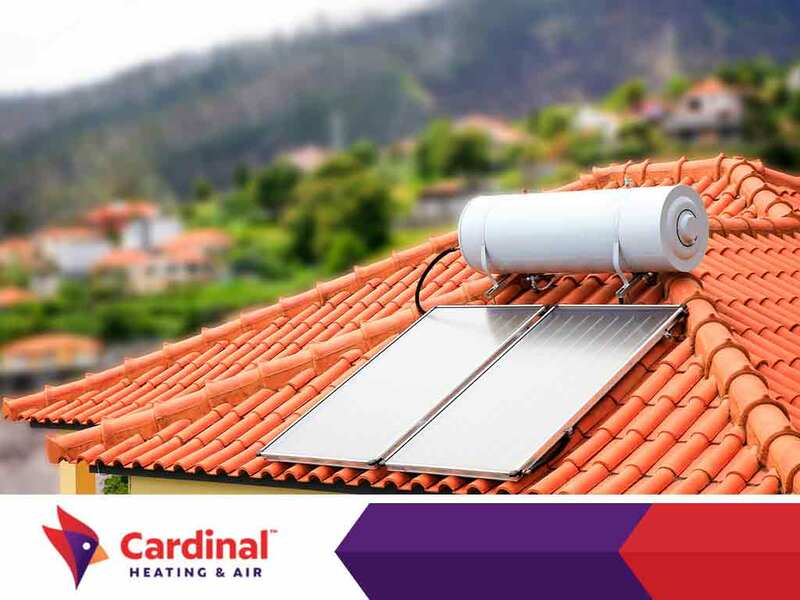 Turn to Cardinal Heating and Air to plan your solar hot water heater installation to perfection. Call us at (425) 296-2097, or complete this form to set your project in motion.